A couple of weeks ago, I asked on the blogs facebook page if the readers liked or hated fruitcake. I was fully expecting a lot of “ewwww, I HATE fruitcake!”. But to my surprise, the vast majority of the responses were people saying they either loved it or had at least learned to appreciate it. Yep… fruitcake. Candied peels, unnaturally dyed cherries and pineapple, the whole kit and kaboodle. I was totally tickled since I have always loved fruitcake. About ten years or so ago, I started making my own. I got the recipe from The New Doubleday Cookbook, one I used to have, but have since lost *sobs* (excellent cookbook btw… if you can find it, get it). Luckily, a few years ago, I was able to find the exact recipe on an about.com site. Yay! 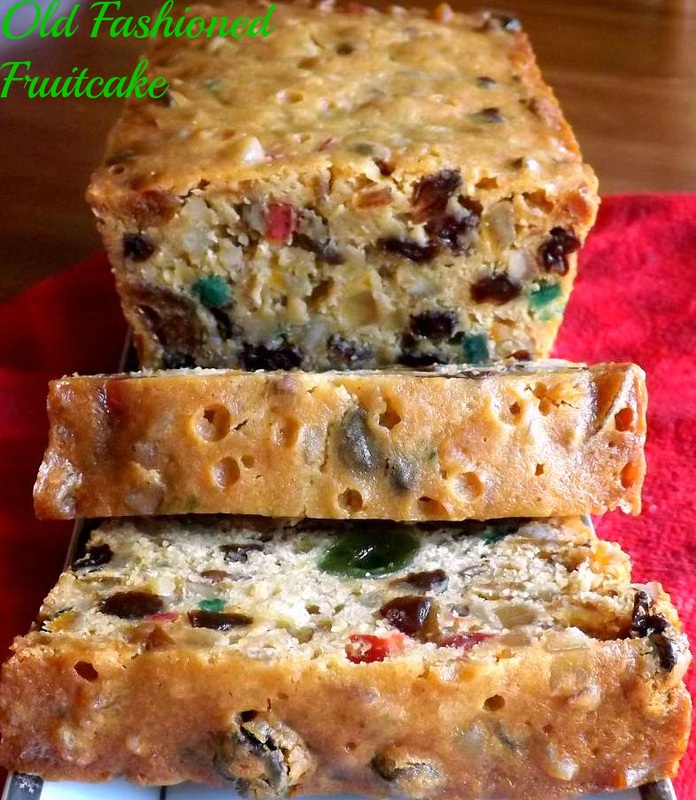 This is a typical fruitcake recipe, similar to what one would get at a higher end grocery or through mail order. But even though the fruits are expensive, this is still cheaper than buying one prebaked, plus you know the ingredients going in and the biggest plus, it tastes ten times fresher. ANDDDDDD, you soak this bad boy in a rum or brandy soaked cheesecloth (you can sub apple juice) to up the drunken goodness lol. This isn’t at all difficult. But you DO need to get this made now for it to be ready for Christmas eating. It is a two day process to make it then it ripens in the soaked cloth for 3 weeks. Could you eat it immediately? I suppose so, but trust me, it tastes far better as it ages. Also, the original recipe calls for making this in a ten inch tube pan. I use two loaf pans; one large, one 8 inch. It works perfectly and that way I have one cake I can soak in rum and one I soak in juice to be kid friendly. Otherwise, I have changed this recipe very little. I add a bit more dried fruit, more vanilla and almond extract, less nuts, no currants and that’s about it. Ok, so maybe I’ve changed it more than I realized lol. Regardless, I’m going to write this as I make it. Place all the fruit mixture ingredients in a large bowl. Stir well to mix. Cover the bowl and let it sit overnight at room temp. The next day, preheat oven to 250 degrees and grease and flour the bottom of either a 10 inch tube pan or two loaf pans. Put a large shallow baking pan filled with boiling water on the bottom rack of your oven. In a medium bowl, combine the flour, cinnamon, nutmeg, cloves, allspice, baking powder and salt. Stir to combine. In a large bowl, cream together the butter and sugar. Add the eggs, one at a time, beating well after each addition. Pour the dry ingredients into the bowl of wet ones. Beat just enough to thoroughly blend. Now, carefull spoon the fruit mixture into the bowl of batter. Stir well to combine and make sure all the fruit is covered well in batter. Pours into the prepared pan or pans. Bake at 250 degrees for approximately 4 1/2 hours, until the cake has shrunk slightly from the sides of the pan and/or until a skewer inserted in the middle comes out with only a few moist crumbs on it. MOIST, not liquidy. This entry was posted in Alcohol, cake, Christmas, Desserts, Holiday Foods and tagged alcohol, Christmas, dessert by Janet. Bookmark the permalink. We get fresh made local ones here in Kelowna that also have chocolate chunks in them. I was wanting to know what “fruit cake mix” is? I’ve never seen that in Canada before. After wrapping to soak for 3 weeks do you refrigerate or leave at room temp? You can leave it, well wrapped, at room temp. I generally just keep the liquor soaked wrap on it, as well as tight foil, and re-wrarp every time a slice is eaten. If you are making it far ahead of time, like more than a couple of months, continue to drizzle it with liquor. Alternately, if making ahead of time, you can soak for the regular amount of time, then tightly wrap and freeze. I have made this in soup cans (greased and parchment paper around) and it is so great!